We’re now to day two of spring, so it’s officially time to start thinking about revamping wardrobe for warm weather. With all the new trends bombarding magazines and blogs, it can be hard to pin down exactly what pieces you should add to your wardrobe. But one tip that I’ve found helpful is to focus on color! This spring’s color trends run the gamut from demure pastels to in-your-face neons, so I narrowed it down to three go-to colors for spring 2012. If I had to choose just one it-color for spring, it would be mint. So soft and pretty, mint hues will add a romantic, feminine, and very springtime feel to your closet. I don’t advise wearing head-to-toe mint, but you could pair the pieces above with many different colors, from other pastels to neutral basics. One perk of focusing on color to get a season’s trends is that it’s easier to budget shop — all the pieces above cost less than $40. Neutrals have been trending for a couple seasons now, so you might already have some of these soft shades in your closet (good news for your wallet there!). 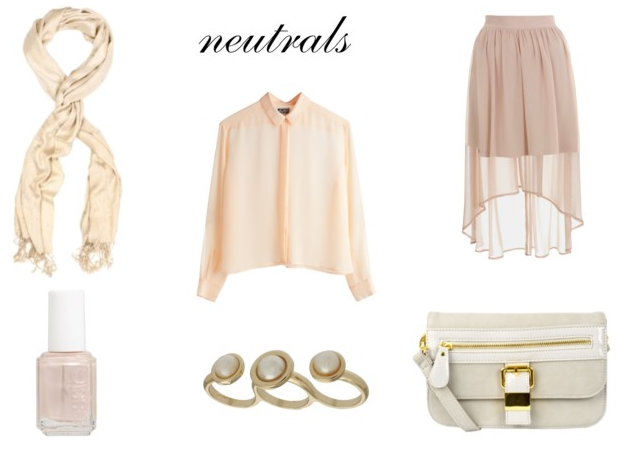 For this spring, layer up your neutrals. Beige, tan, grey, and oatmeal, there are too many neutral hues to count, but I like the white-to-peach palette above. You can get a very romantic look with layered chiffon and sheers, and the high-low skirt above would be a very trendy addition to your wardrobe. While mint and neutrals are both softer shades, brights are also in for spring. I’m not going to lie: I’m not crazy about the neon trend. But one bright color that I’m loving is orange! From tangerine to grapefruit to blood orange, the spectrum of citrus hues is wide. You can pair orange with neutrals, or even contrasting colors like cobalt blue or turquoise. What is your must-wear color for spring 2012? Author bio: Sarah Heckle has an Indianapolis fashion blog. She is anticipating spring for warmer weather, longer days, and her best friend’s wedding!